Dumplings are one of my favorite things in the world. I grew up in a small town in country NSW and when we visited Sydney the biggest treat was yum cha in Chinatown. My family still loves yum cha, because dumplings! We always over order, concentrating our appetites on the steamed dumplings, particularly the chive and spinach ones, because it feels extra wholesome to get a bit of greenery with your dumpling fix. These golden potstickers are a distant relative of the Chinatown yum cha dumplings with their delicate translucent skins. They’re a much more robust, slap-dash, hippified version. I’ve changed up the original version by throwing in a bunch of chives which makes them more green than golden but you can’t go wrong with wacking a whole heap of chives in your dumpling mix. They can be steamed them but I think they are better as potstickers with golden-brown, crunchy bottoms. 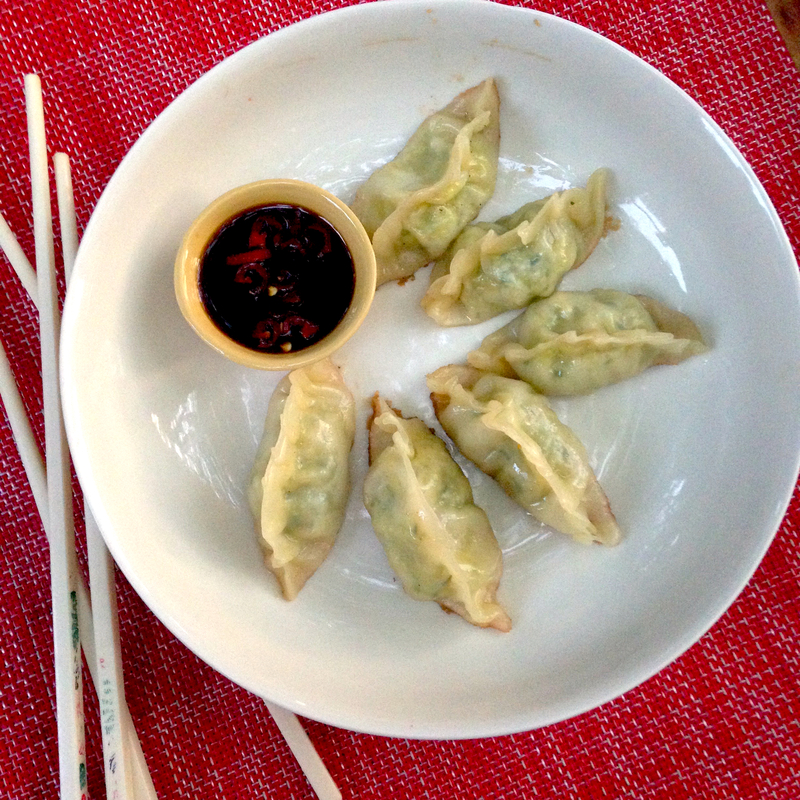 Best of all, these dumplings freeze excellently so you can have some stashed away to cook up for an after school snack or when a dumpling craving hits. Place split peas and chives in food processor and pulse until split peas and chives are ground to an even, fluffy consistency. Heat three tablespoons of oil in fry pan and saute shallots until beginning to brown. Add sugar and salt and saute until shallots are slightly caramelised. Add split peas and mix through until well combined. If the mixture is too dry add in a few splashes of water. You need the dumpling mix to stick together. Taste and adjust salt if needed. Allow dumpling mix to cool. Place a heaped teaspoons of mixture in slightly centre of dumpling skin, wet edges of dumpling skin with watered fingers and pleat and crimp edges together. Flatten bottoms of dumplings and place on a lightly floured board or plate. If there are any dumplings you don’t want to cook at this point, they can be frozen and cooked later. Serve on a platter with chilli dipping sauce. Mix together soy sauce, vinegar, sugar and chillies until sugar dissolves. Taste and adjust vinegar, sugar and chilli to taste.